The Megadeth slot from Microgaming is a typically rocking machine from one of the industry’s best producers. It features imagery of the entire band, some of their more memorable tracks, and a load of innovative game features to boot. If you’re a fan of the band Megadeth or just creative slot machines in general, this one will likely appeal to you. Great soundtrack. 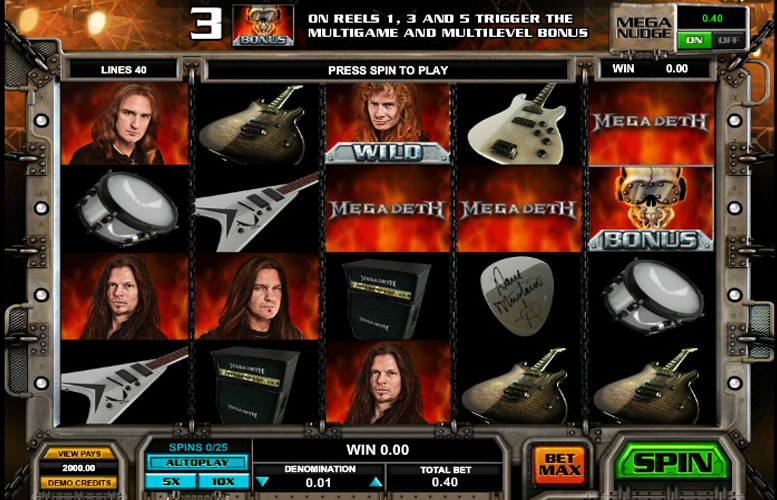 The Megadeth slot machine features excerpts from loads of the band’s classic tracks. Get ready to bang your head! Innovative game features. There are loads of different bonus features on this title. These really add to the game’s replay value. Some of the features are rather confusing to understand. It might take a few reads of this guide or the game information screen to fully grasp the likes of the “Head Crusher” bonus. One of the game’s features requires an extra payment. This limits the enjoyment that lower bankrolled players can get from the title. 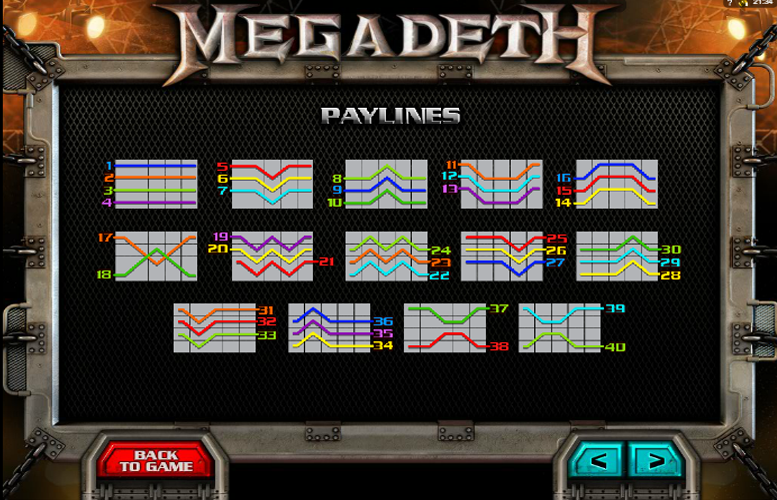 Megadeth Logo = 500x the line bet. Dave Mustaine “Wild” = 500x the line bet. David Ellefson = 300x the line bet. Shawn Drover = 200x the line bet. Chris Broderick = 150x the line bet. The Mega Nudge Feature grants the player one, two, or three moves or nudges between reels two and four combined to get the best possible winning combination. The reels will not move if the player cannot achieve a better combination. When this happens, the regular prize is paid. The cost of playing with the Mega Nudge feature is 40x the bet per line. Landing three “Bonus” symbols on reels one, three, and five in any position will trigger the “Multigame and Multilevel” bonus. Players must spin the Mega Wheel to go to “Hangar 18” Free Spins Bonus, “Head Crusher” Bonus, or to get an instant win. Any of the three previous alternatives may come with an “Advance to Next Level” or an “End of Bonus”. Bonus wins are multiplied by the total bet minus the “Mega Nudge” bet if it was active during the spin that won the entry to the bonus. Level one will award between five and eight free spins. Level two will award between eight and eleven free spins. Finally, level three will award 12 to 15 free spins. 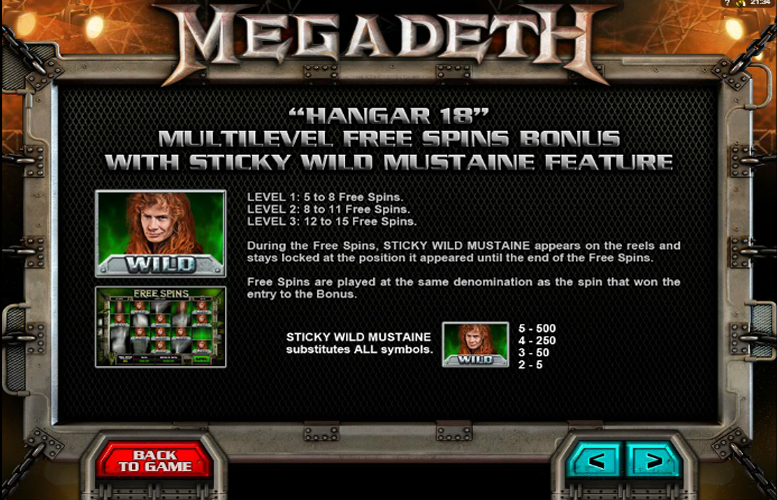 During the free spins, Sticky “Wild” Mustaine symbols will appear on the reels an will stay locked in their position until the end of the free spins bonus. 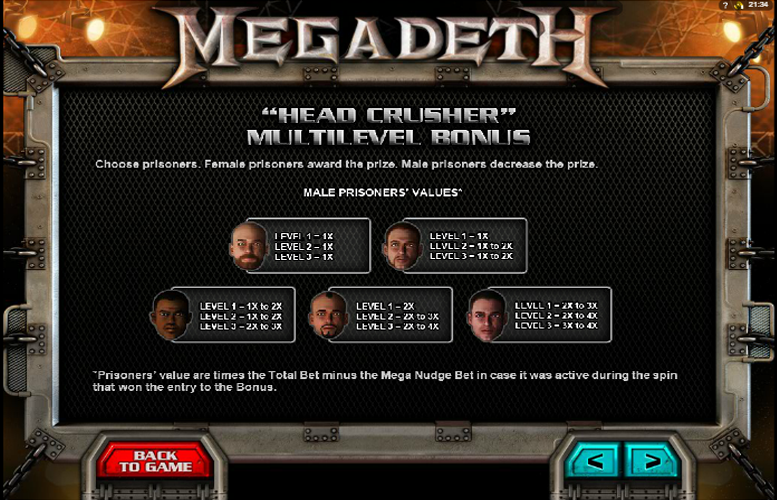 Players must choose from various prisoners. Female prisoners award prizes, male prisoners decrease the prize. Each of the five prisoners have different values. They are multiplied by the total bet minus the “Mega Nudge Bet” in case in was active during the spin that won the entry to the Bonus. Flying V Guitar = 100x the line bet. Black Guitar = 80x the line bet. Bass Guitar = 75x the line bet. Drum = 75x the line bet. Amp Stack or Plectrum = 50x the line bet. 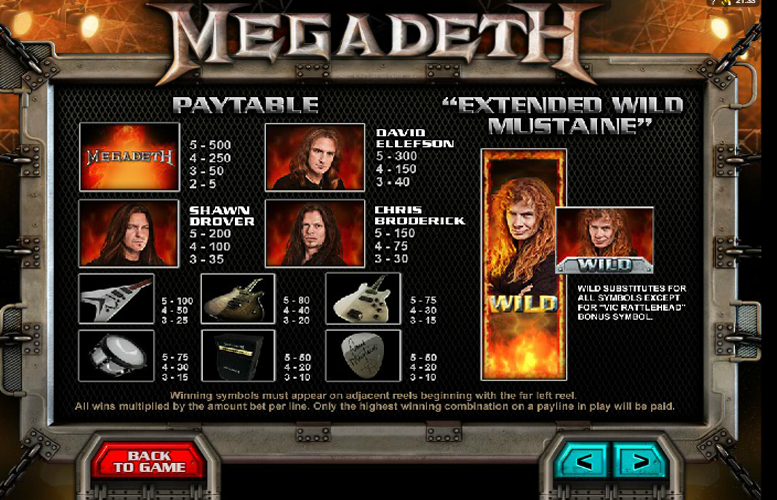 The number of win lines are fixed on the Megadeth slot machine at 40. This means that players can only adjust the amount they bet on each line. Here, the minimum is 1p and the maximum is £3. This makes the lowest possible bet per spin just 40p and the highest £120. These values are all doubled if the Mega Nudge feature is active. The Megadeth slot machine is a great title for those who love thrashing out with one of the world’s most popular metal bands. It has a hugely diverse array of features, fantastic artwork, and of course, loads of tunes from the band themselves. That said, fans of simpler slot machines might find the whole thing unnecessarily confusing. The innovative bonus features of the game does mean that gameplay isn’t exactly straightforward. Those who like a more basic slot experience would be better served elsewhere. This game has a rating of 4 / 5 with 483 total reviews by the users.